Elves average a height of 6’5” and are slender. They have many different skin and hair colors, and every elf has pointed ears. Their features are more angled than humans, and more slender than dwarves. They live an average of 250 years. The elves vary greatly in culture, but they share some similarities that players should keep in mind. In the current Age, they have not been seen in Uteria for 700 years. When they arrive in most human populated areas, they are looked upon with shock and even fright. They have an aura that seems alien and strange to humans. This effect fades with time, but in each place that they go, if the humans have not encountered many elves, their appearance may cause problems. 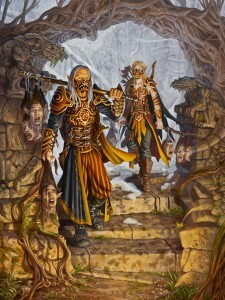 During the Disappearance, all elves were pulled into the limbo between worlds. 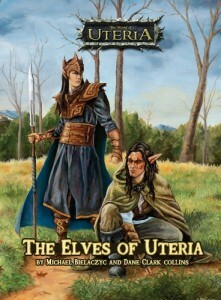 Time was slower there, so while the Uteria moved forward almost 700 years, for the elves it was only about 350. They could see glimpses of Uteria flashing by, but they could not interact. The elves who have now begun to return are entering a world unfamiliar to them—a world they only learned of through stories from their parents. They would find humans strange, and this world, which is much more “solid” than the limbo they were born into, could be overwhelming. 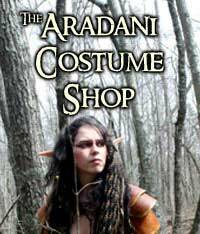 The elves who have returned grew up in a strange, dreamlike world, and are now confronted with a new world. When playing an elf, this should be kept in mind. Although the elves are powerful, they should not be used as super characters. In fact, there are many great roleplaying opportunities. For example, a low wisdom elf may have a hard time understanding the outside world. The culture she or he comes from may accept magic as normal, but using it in a human tavern could cause the locals to rise up against the “demons using witchcraft”.